In a 2014 joint survey conducted by Kaspersky and B2B International, 24% of respondants (almost 1/4) lost physical media backup copies that they had produced. Obviously, these statistics are shocking and disturbing, especially in the world where data is so important and a compromise of it can result in serious implications. There is another ugly face on the scene - Malware. Malicious attacks accounted for 1/3 data breaches in 2016, this is up from 18% in 2014. Meanwhile losses caused by staff or internal issues from 32% in 2014 to 24% in 2015. Data breaches involving ransomware DOUBLED last year. Radware® (NASDAQ: RDWR), a leading voice in the cyber-security world states that 49% of businesses confirmed being hit by some form of cyber-ransom campaign in 2016. The attackers are simply following the money and one of the most cost-effective ways to protect yourself and your information is to perform regular backups. 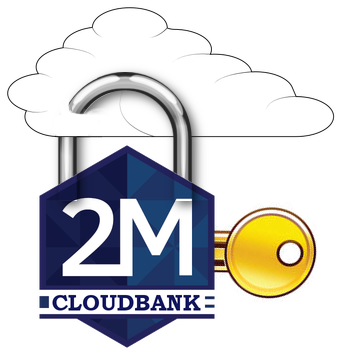 2M is leveraging the Microsoft Azure Cloud and provides a Disaster Recovery and Business Continuity tool with CloudBank, our managed backup solution which saves versioned copies of your important data in a durable, secure and accessible location. Your data is encrypted before it even leaves your premesis and only your private key can decrypt it. CloudBank is a Managed Backup Solution that automatically backs up data to secure cloud storage. Due to its ease of use and its powerful functionality, recovery plans in case of a disaster are simple, cost-effective and reliable! Compress your backups reducing the amount of space used in the cloud!